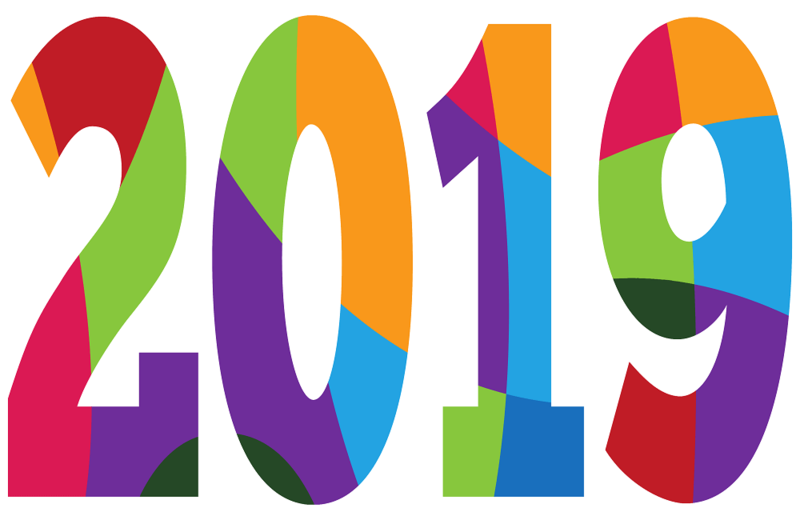 New Year 2019 is knocking on the door and we cannot be more excited. The year 2018 went in a snap and we couldn’t even make the most of it. I’m sure there are many people like me who are taking 2018’s baggage to 2019. But isn’t life all about this? When we’re unable to complete a task on time, we carry forward it to the next year, until it’s done. We shouldn’t beat ourselves for not being able to complete things on time. This in no way means that we should be careless towards our lives and the responsibilities it comes with. We should give our best, but without being hard on ourselves. Anyway, enough with the philosophical rant. 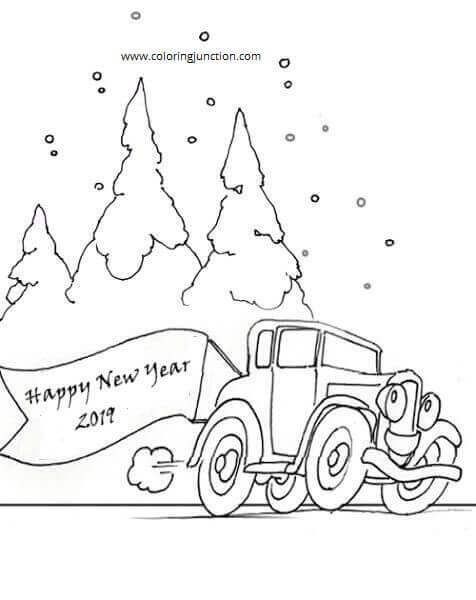 We shall now proceed to our free printable New Year 2019 coloring pages. 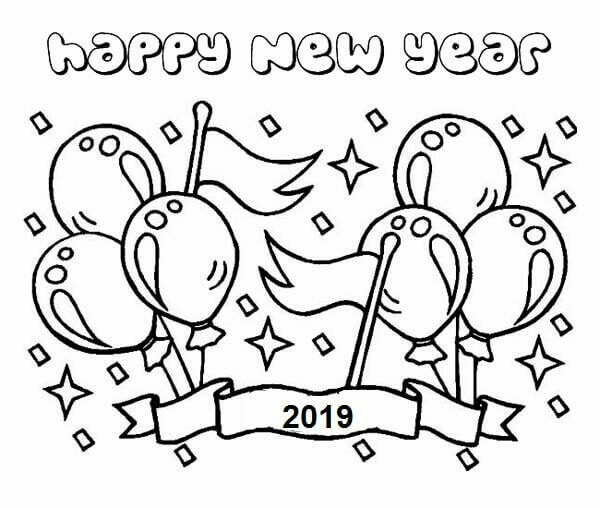 These 2019 New Year coloring sheets will get the kids in the festive spirit. Take a look! 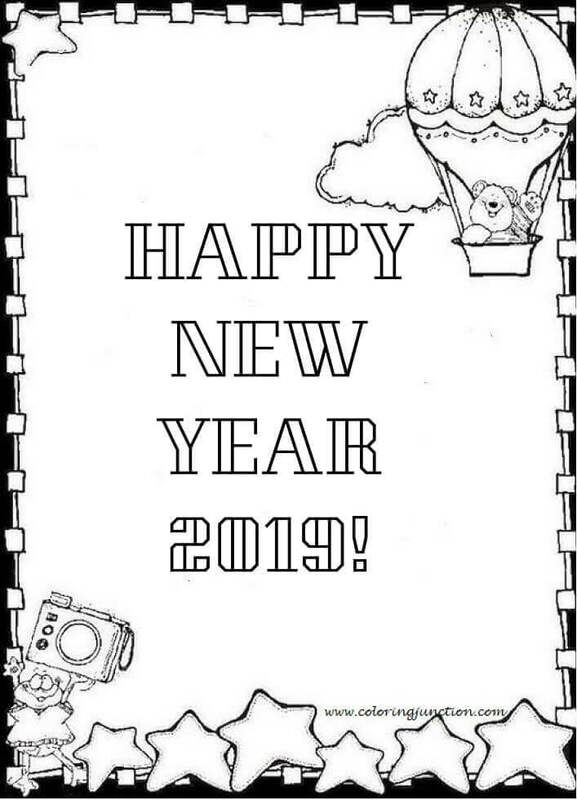 We’re kicking off the list with a simple New Year 2019 coloring page that celebrates the advent of the new year in the best way possible. 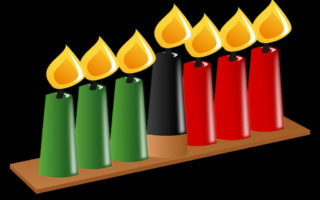 It’s an image of things we usually use to decorate our houses for a new year, such as balloons, flags, banners and more. 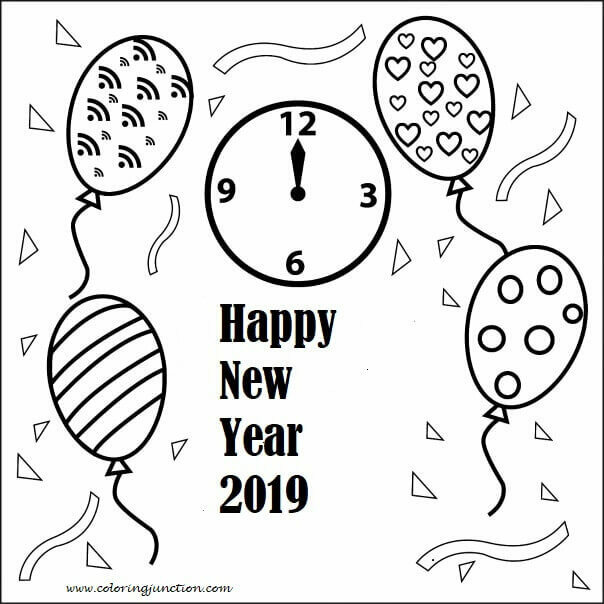 The clock has struck 12 on this coloring sheet, so welcome the new year with pomp and happiness. 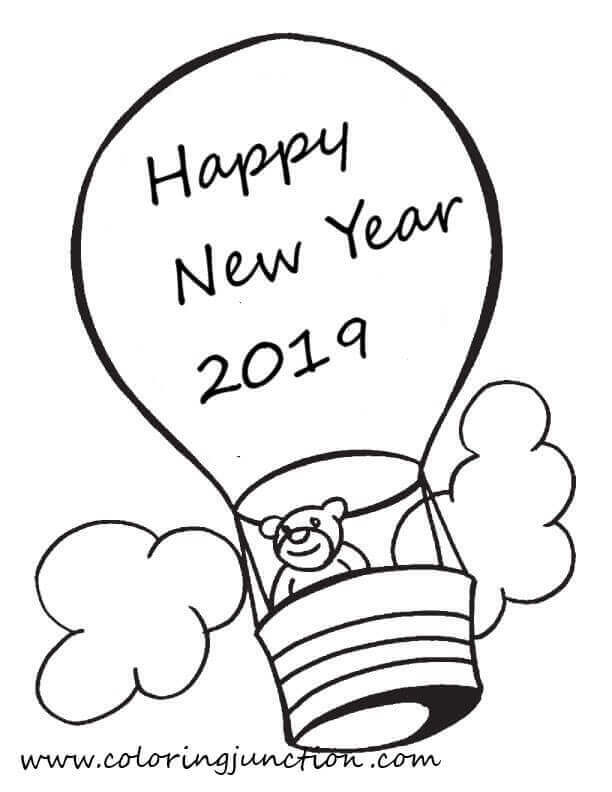 Or, you can fill this pretty 2019 coloring sheet, which features various shapes inside a balloon such as hearts, circles, triangles and more. It’s a pretty simple coloring picture and can be filled even by preschoolers. If you’re feeling artistic, you must try your hands at this incredibly detailed 2019 coloring page. This 2019 printable is extremely intricate and will require tremendous effort and concentration. This coloring picture is best suited for teens and adults. Ring in the year new this absolutely fantastic coloring sheet featuring all the elements we need to celebrate the onset of the new year. It features party hats, firecrackers, calendar, confetti, and more. So you have a lot to fill in this coloring sheet. No one would be as happy as this teddy bear on the arrival of the new year 2019. He’s so happy that he decided to go on a hot balloon tour of the city. Since this coloring sheet is very cheerful, we’d recommend you to use happy and vibrant shades for filling it. 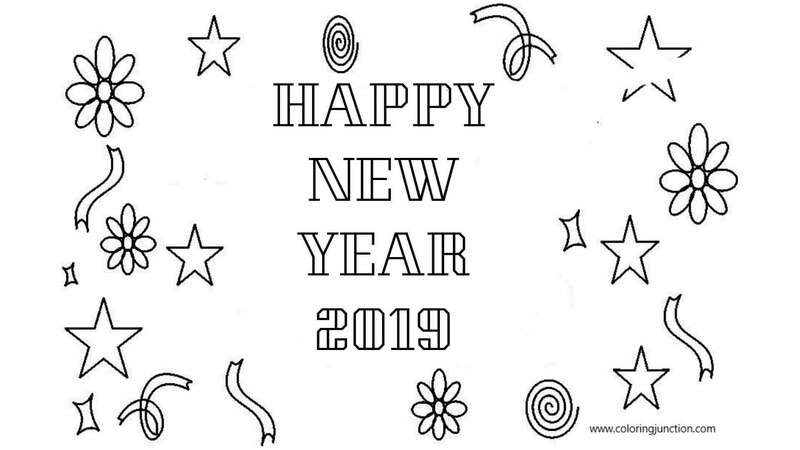 If you’re planning to send out cards to your friends and relatives, we’ve got a cute New Year 2019 card template for you. You can print out this coloring picture on a cardstock paper, decorate it any way you like and send it to your friends. Don’t forget to write a heartfelt greeting on it. 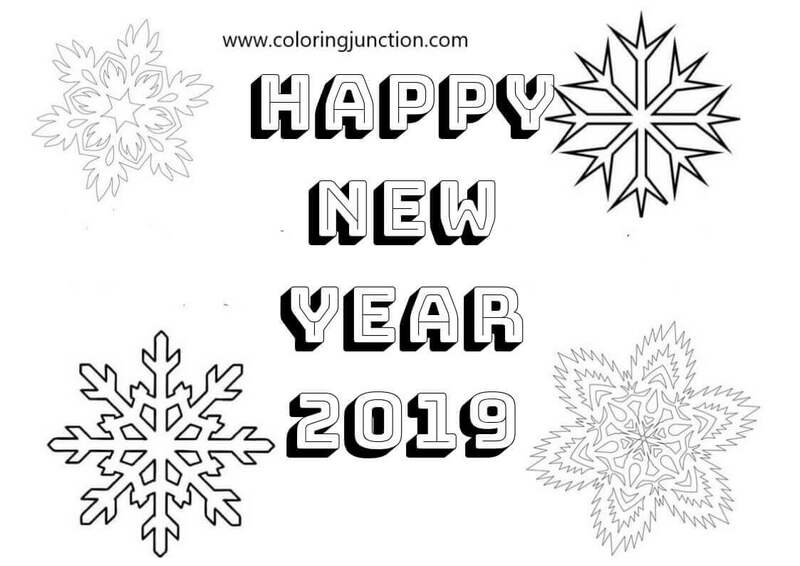 Here’s the pretty new year 2019 coloring picture featuring intricate snowflake images and wordings, “Happy New Year 2019”. 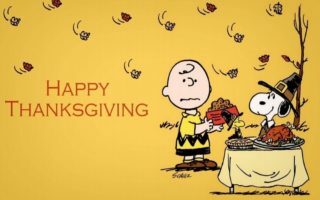 You can use even this picture as your card template. Ensure that you use blue and silver glitters for decorating the snowflakes. Have you ever seen a calm and happy dragon? We strongly doubt because dragons are ferocious creatures always ready to blow fire from their nose. 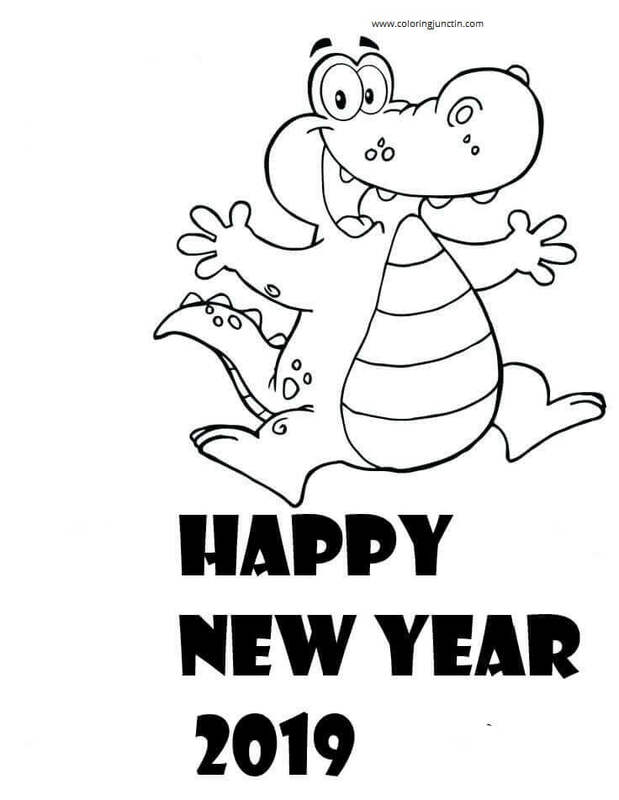 But such is the fervor of new year that even this dragon appears to be in a jolly mood. Look how happily he’s wishing you all a very happy new year. If dragons can wish happy new year 2019, how can Statue of Liberty be behind? This strong statue is braving the snowfall to wish you all a very happy new year. We can even see a Christmas tree and some gift boxes piled behind her. Who said Santa goes into hibernation after Christmas? He stays until the new year to give seasons greetings to everyone. In this picture, we see Santa, holding a banner that says Happy New Year 2019. So enjoy! 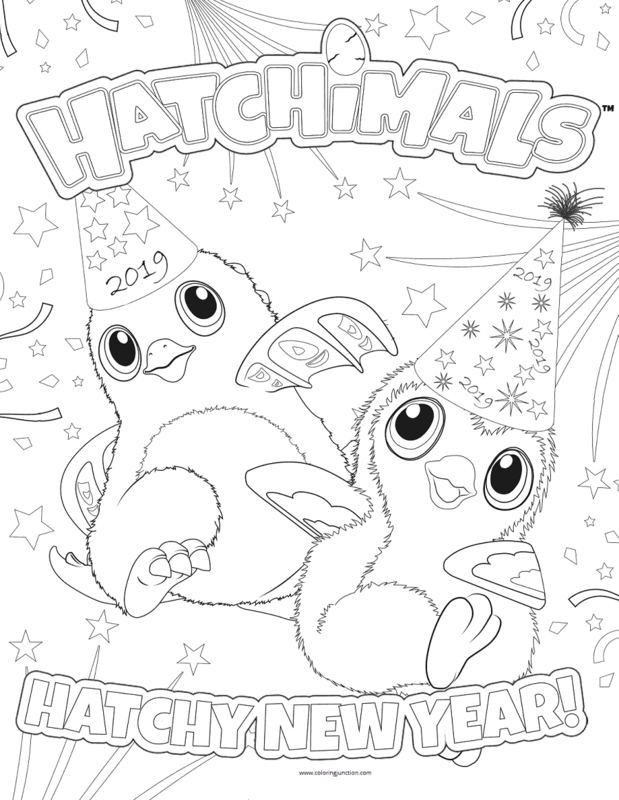 People will surely find hard to get into festive spirit seeing these Hatchimals rock the 2019 New Year party. The background of this coloring sheet is absolutely amazing and will give enough opportunity to the kids to showcase their artistic talent. Don’t forget to fill the 2019 party hat. Grand fireworks are seen all across the world commemorating new year and this picture aptly captures it. 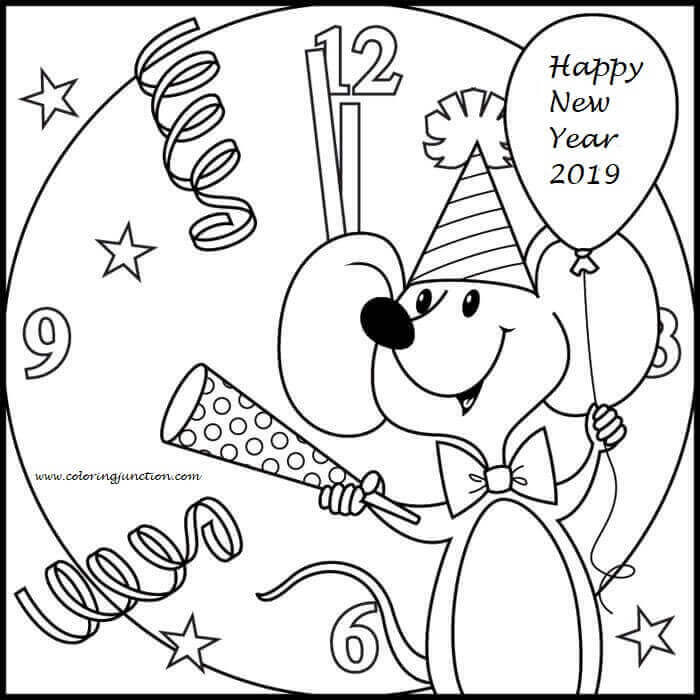 Children will surely enjoy filling this new year firework coloring picture, which is easy enough to be filled by kindergarteners and detailed enough to be enjoyed by teens. Even this jeep is ultra happy on the occasion of new year, so much that it has tied a ribbon on its back that says, Happy New Year 2019. The scenery suggests that it snowing, so keep that in mind while you’re filling this picture. How cute does this mouse look wishing everyone 2019 New Year? He’s wearing a party hat, holding a balloon and a whistle in his hands. Mr. Mouse is standing in front of a huge clock, which suggests that it’s a new year already. No wonder he’s so excited. 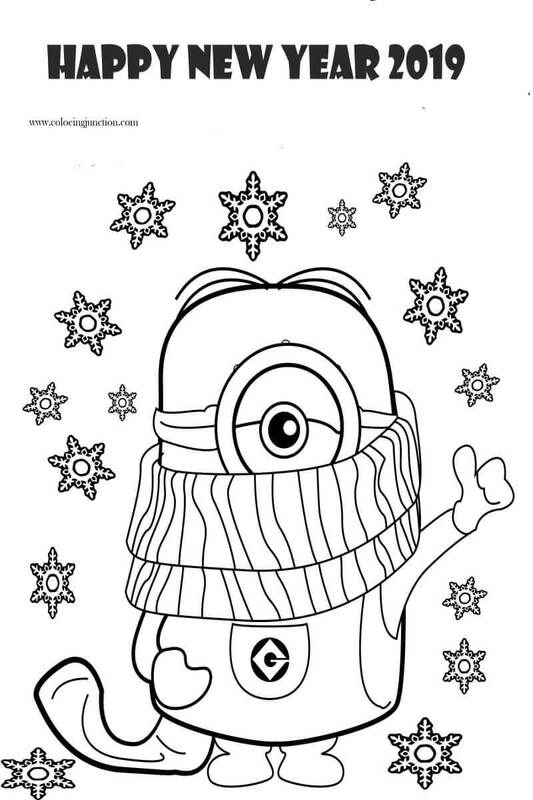 If you’re a minion fan like, we’d strongly suggest you print out this coloring page featuring one of our favorite characters wishing everyone a very happy new year 2019. The minion is wrapped in a muffler and is braving snowfall just to wish you all. So keep him some color to keep him warm and fuzzy. 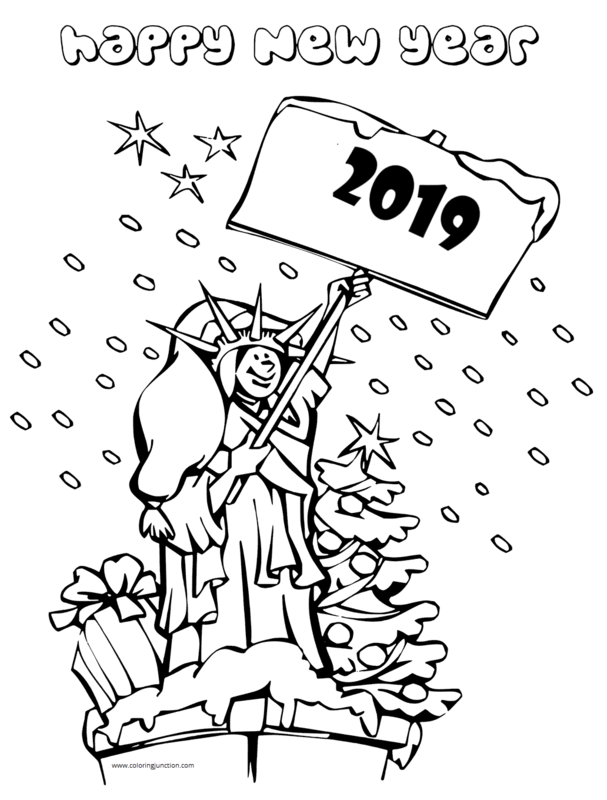 Here’s a fairly simple New Year 2019 coloring picture to fill this holiday season. 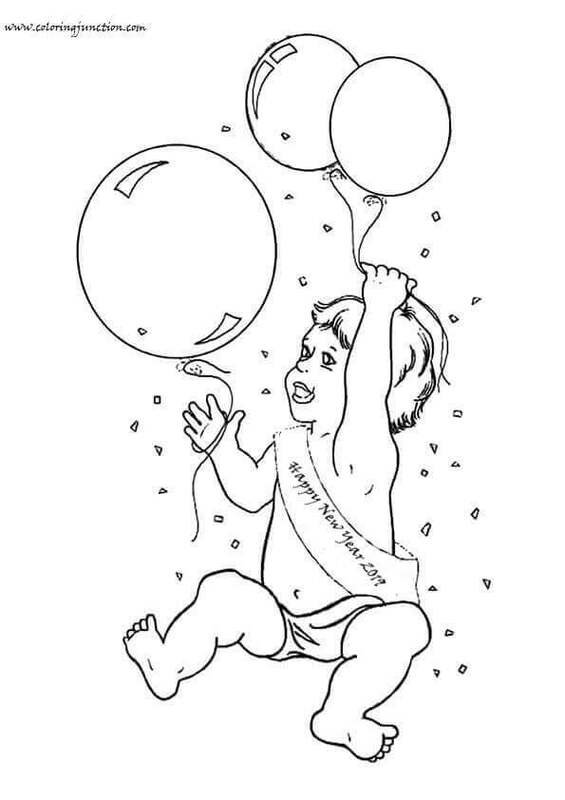 The coloring sheet has small elements, such as streamers, flower, and stars for you to fill. 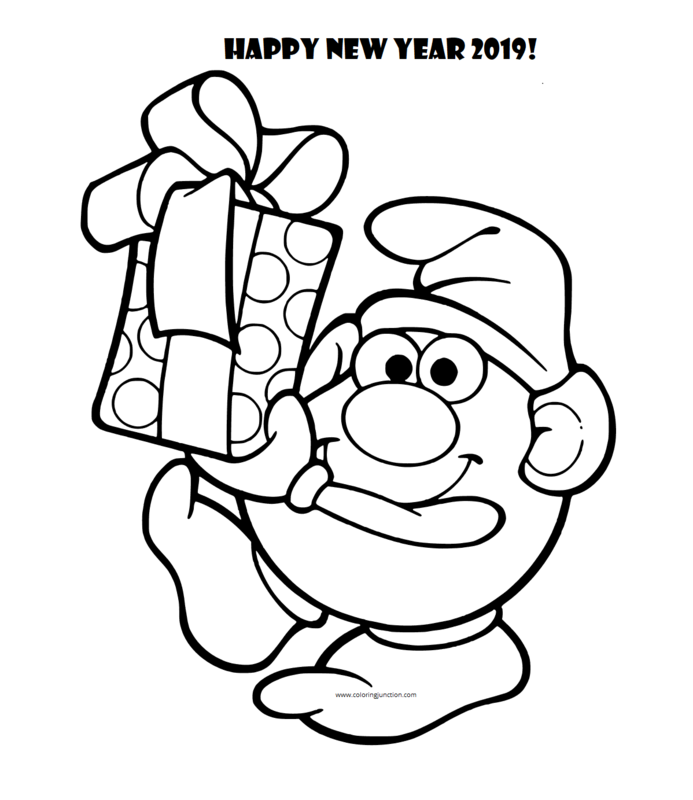 Here’s a coloring sheet of Baby New Year wishing everyone a happy new year 2019. The Baby New Year is basically the personification of the beginning of the new year. He symbolizes the passing of the previous birth and rebirth of the new year. In this coloring sheet, we see a Smurf carrying loads of gift boxes. He has probably got gifts for his family on the occasion of new year. So fill this coloring picture to make him look more vibrant. Don’t forget to color his body blue. 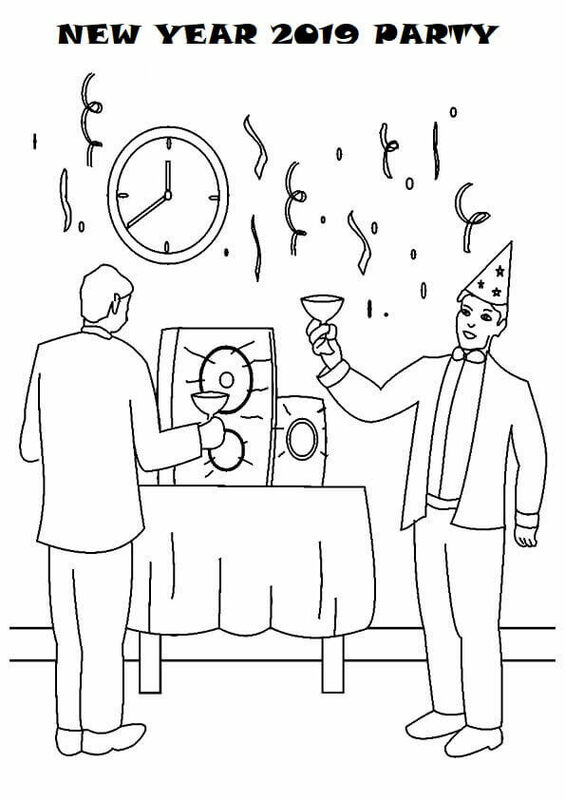 Here’s a coloring sheet of a group of people enjoying the 2019 New Year eve party. Since the theme of this coloring sheet is a party, we’d suggest you use glitters and vibrant shades to make it stand out. This coloring picture shows the adorable, Mr. 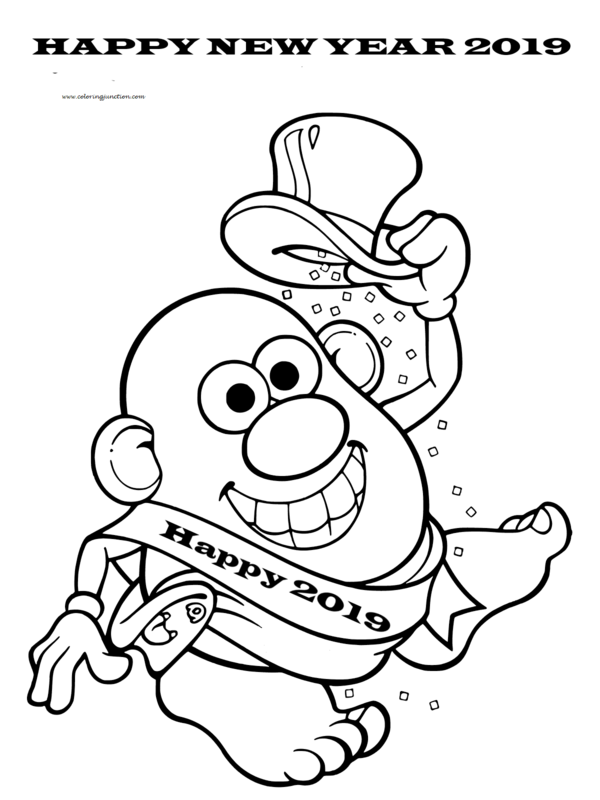 Potato Head from “The Toy Story” wishing everyone a very happy New Year. You’ll get to see this jovial figure once again in “Toy Story 4”. 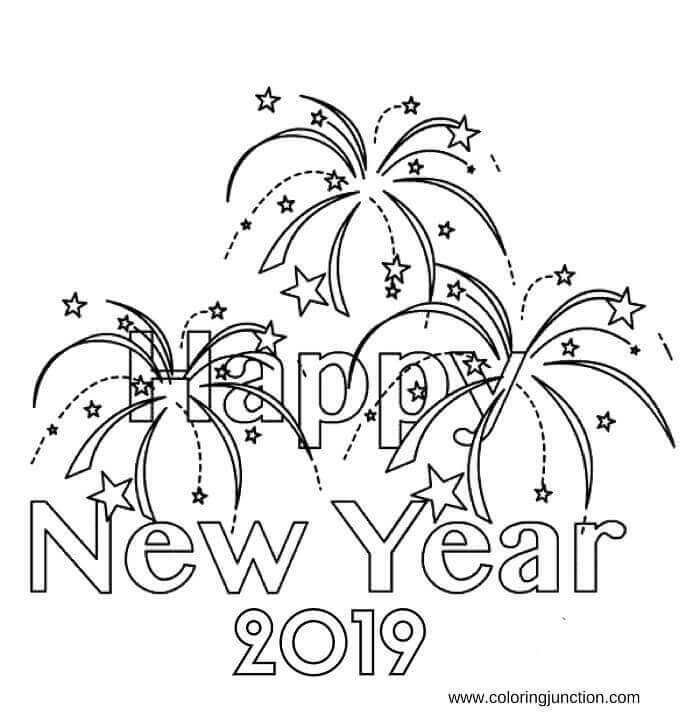 So these were the best 2019 New Year coloring pages printable. We will be updating the article with more 2019 coloring pictures soon. So stay tuned.